Doosan launched their first Tier 4 Final-compliant wheel loaders. The equipment is optimized for use with a high-pressure common-rail fuel delivery system and cooled exhaust gas recirculation system. The wheel loaders come standard with a 3-year subscription to Doosan Telematics for maintenance monitoring, troubleshooting machine issues, and remotely monitoring machine location, hours, fuel usage and more. Volvo Construction Equipment launched its new diesel engines to meet EU and US Tier 4 Final/Stage 4 emissions legislation. The new engines improve fuel efficiency by up to 5% over previous models and reduce overall running costs. The engines can be remotely monitored using the Volvo CareTrack® telematics system, which can be used for a variety of other functions including fuel consumption monitoring and service reminders. 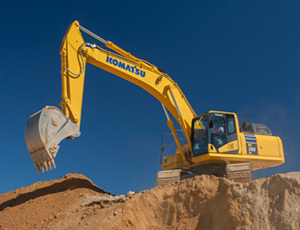 Komatsu America launches the new PC390LC-11 Hydraulic Excavator which is EPA Tier 4 Final emissions certified. In addition to upgraded cab features and an enhanced power mode for greater productivity and lower cost per ton, the control system is integrated into the machine’s on-board diagnostics systems and KOMTRAX®, Komatsu’s standard telematics system. Caterpillar has launched the Cat M-Series small wheel loaders that include new engines meeting Tier 4 Final emission standards. Included is a three-year subscription to the web-based VisionLink® interface, via cellular or satellite connection. It offers customers the ability to see fuel status, work time versus idle time, and upcoming service needs. John Deere launched its new Tier 4 Final excavator with 19% more horsepower and 17% more swing torque. Combined with larger hydraulic pumps, the 300G LC promises more digging and lifting power. It comes with a with a free three-year subscription to JDLink, John Deere’s proprietary telematics system.